When Jenny came to Italy in the sixties she found that most riding-centres fell into two categories: on the one hand there were the scruffy ones where the horses were underfed and overworked and on the other the snobby ones, where the teaching was good but where even the horses looked at you with condescension. So when she decided to start the Riding-Centre in 1969 she was determined that her horses should be well-fed and well-treated, that the teaching should be informal but of a professional level and that people from all walks of life should feel welcome there, so long as they loved horses as she did. The situation in the Italian horse-world has much improved since 1969, but Jenny has continued to maintain the standards she set herself. The horses, all trained in the English style of riding (she is English, after all!) are sleek and fit and even those which are stable-kept spend some hours in the paddocks every day if they are not ridden. There are two rings: a small one for beginners and a large one for more experienced riders who want to improve their style in flatwork and over small jumps. Eraldo, our BHS instructor, speaks good English and is specialized in helping the nervous rider. Most guests already know how to ride and prefer to explore the unspoilt countryside, naturally with an experienced guide. The novices go for short, leisurely rides, the experienced riders do more trotting and cantering. This is not fast riding country, but there is so much to look at that speed is not an issue and in a week’s stay the riders will never do the same ride twice. They will follow trails through vineyards, olive-groves and woodland without any landowners objecting and without meeting a single gate, something that never ceases to amaze. 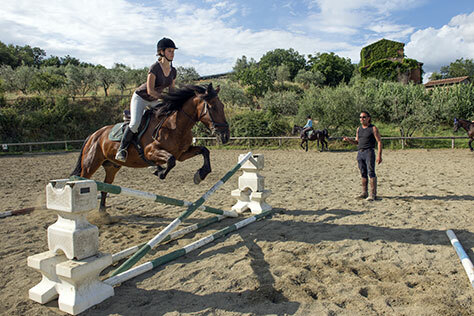 In Spring and Autumn Jenny and Eraldo, both qualified guides, lead small groups of riders into the famous Chianti region between Florence and Siena. The participants, who must be experienced and fit, will visit abbeys, castles, Romanesque churches, wine-farms and medieval villages. There are lavish picnics at lunchtime and in the evening the riders will dine and sleep in comfortable farm holiday centres or small hotels. 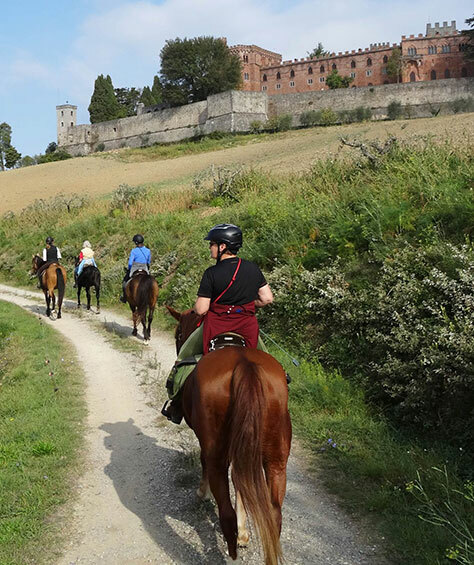 In the year 2019 we can offer you five distinct riding programmes: “Discover Tuscany” (one week), “Riding and Dining Tuscan” (one week),”Riding and Fresco-Hunting”, (one week), “Discover Tuscany Family Week” (one week) and “A Taste of Tuscany” (four days). For details consult the section CONTACTS (“prices and dates”). Please note that like many riding-centres we do have a weight limit of 190 lbs., as this is hilly country and at times hard work for the horses. Our age-limit for children is ten (twelve if they are to take part in riding-programmes, always accompanied by an adult). We have, however, no upper age-limit, as elderly riders are often the most experienced, although they may need help mounting and dismounting. The saddles are English style and of excellent quality. Seatsavers are provided for those who want them.